Aber trotzdem kann man ja mal über das Stars and Stripes Project von Adrian Champion bloggen. ein paar eher bekannte Bekanntheiten draufmischen – fertig sind die White Stripes Reimagined Mash-Ups. Nebst “Full Album” kann man ausserdem noch die “Instumentals” downloaden. Wie nett. “I was late jumping on The White Stripes bandwagon. But, when I heard “Doorbell” a few years back I became an instant fan. That raw, classic sound was so fresh to me. I went straight to iTunes and downloaded the whole album. It wasn’t long before I owned everything they’d ever released. What really got me was that I wanted to sample almost every song. But, I couldn’t just shamelessly sample their whole catalog. Plus, I had just decided to move away from sampling and focus on writing original music. So, a remix project seemed like the thing to do, and the idea was born. I started digging through my collection and fitting all the pieces together. My goal was to use only samples from The White Stripes and a cappellas from classic songs and my favorite emcees. And of course, I had to rap on one of the tracks myself, with my man Brian Jacobs on the hook. 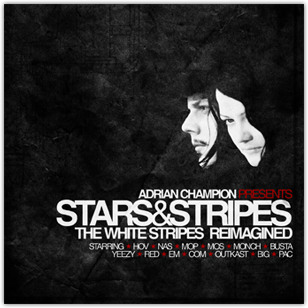 So there it is, hip-hop fans, meet The White Stripes. Zurück Vorheriger Beitrag: Es wird wieder blutig!